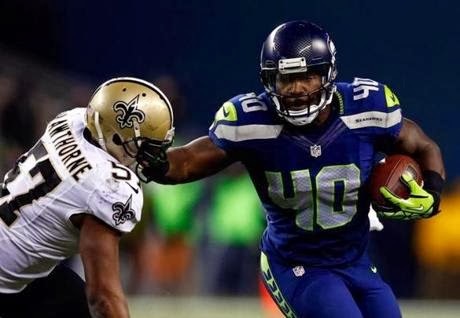 Seattle Seahawks fullback Derrick Coleman probably had every reason to quit pursuing a career in football. Heck, it took incredible courage just to get on the field period. After all, he’s been hearing-impaired since he was a child. Despite setbacks and doubts from coaches and scouts throughout his football career, he bounced back -- every single time. He went undrafted in the 2011 NFL Draft. After getting picked up by the Minnesota Vikings as an “experiment” at running back, he was released. But he pushed forward and became the first deaf player in NFL history to play offense. And this past weekend, he played in the biggest event in American sports: the Super Bowl. The Seahawks stunned the Denver Broncos 43-8 in the 48th edition of the iconic game, and Coleman is now a Super Bowl champion. How did he do it? He did something spectacular -- he turned what most assumed to be a weakness into a strength. His high school coaches say he focused and concentrated more than the average player does. When he landed on Seattle’s practice squad in 2012, he hung around quarterback Russell Wilson and earned his trust. He did whatever it took to get on the field every Sunday. There is one part of his story that I found fascinating. It’s no secret that elementary school can be a cruel, cruel place. And that was especially true for a kid who wore two bulky hearing aids everyday. Coleman had to endure constant verbal attacks at the hands of his peers. But he had the option to do something I’m kind of jealous of. "That's the one good thing about having [hearing aids]," Coleman told ESPN.com’s Tom Friend. "You guys have to actually listen when somebody's talking. I just turn 'em off." He turned down the volume on his hearing aids and tuned out the haters around him. Honestly, I wish it was that easy sometimes. And after being attacked in the playground when he was about 9, he went back to his room and did push-ups. His “weakness”? He wouldn’t let it -- or those eager to point it out to him -- deter him from getting better. Even when he was 9. That's courage. We all have weaknesses. And we all have people more than eager to point them out in our lives. Turn down the volume. Turn around and do some more push-ups, instead. Boast in your weakness, because Christ isn’t done with you yet.